These are some of my favorite rocks stars in the large collection I have. 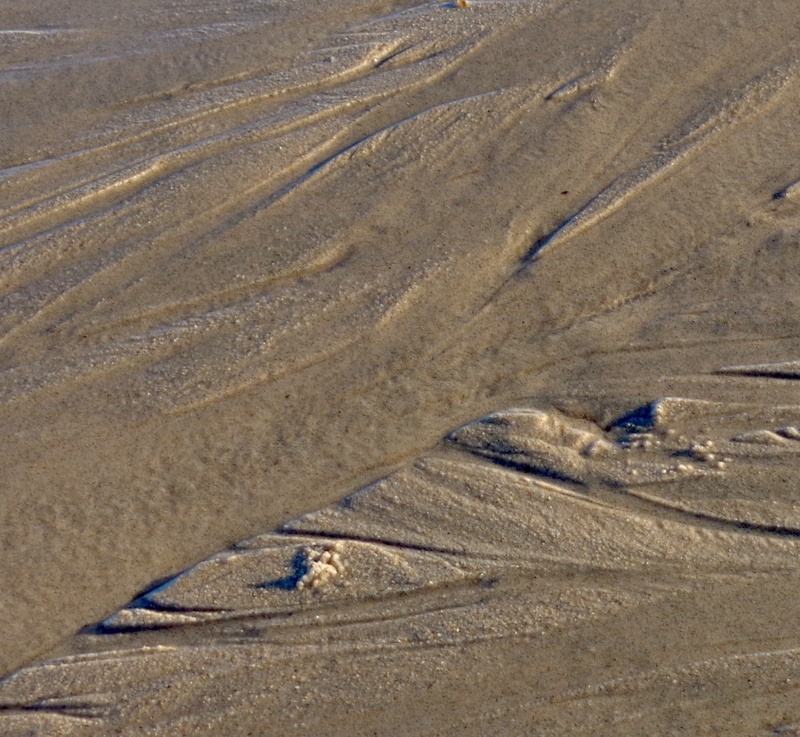 If you’re a regular visitor to this site you’d probably have picked up on that, and have seen them in my paintings and drawings. The bottom rock I found near Findhorn in Scotland, the top one from Block Island, off the coast of Rhode Island. 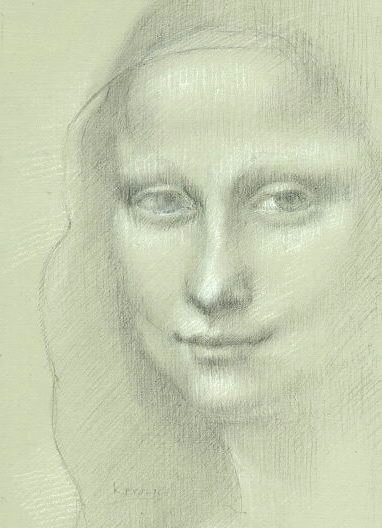 Silverpoint is a centuries old drawing medium, predating the graphite pencil; think about that for a second. It’s getting more and more popular these days, not surprising to me since it is a meditative medium and has a calming effect. 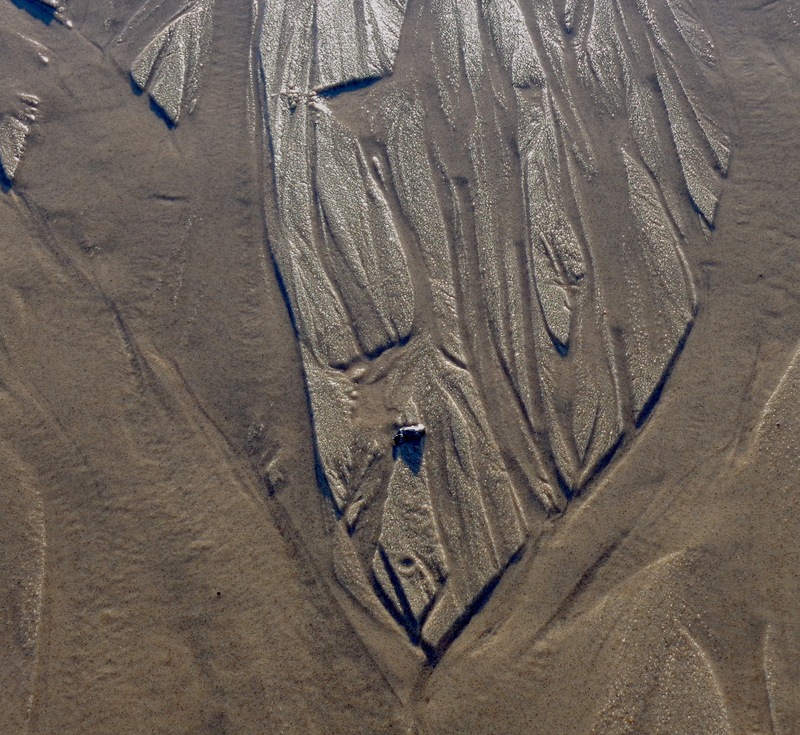 You and the object of your attention. 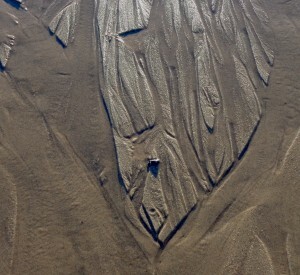 The more you look, the more you see and become absorbed in…writing line after line, keeping a diary of sorts. 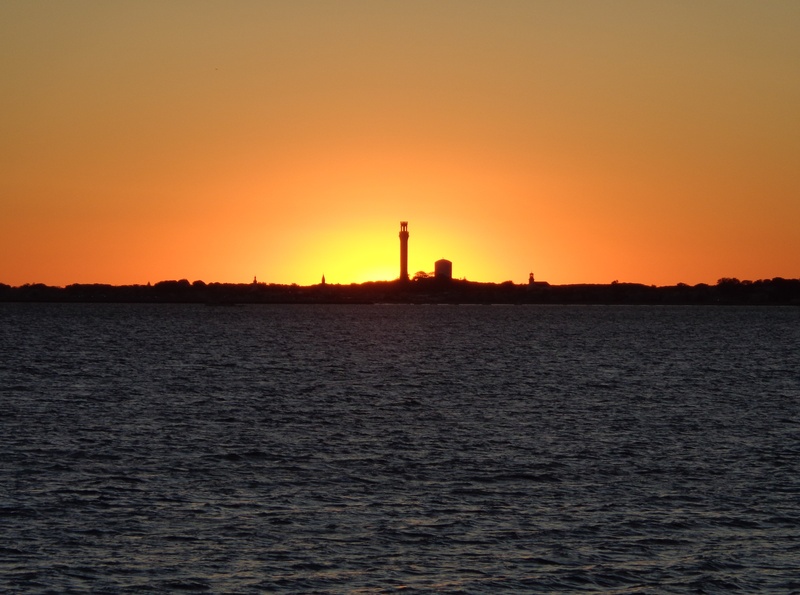 It has been a week of bliss here in Cape Cod, Massachusetts – gorgeous weather, gorgeous sunsets, beautiful rest and relaxation! 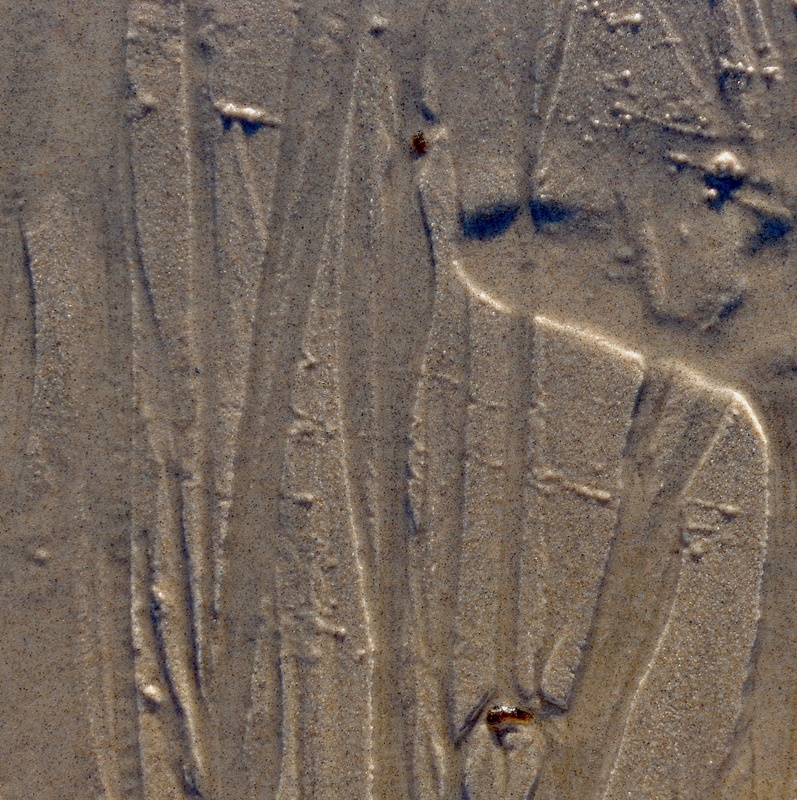 The ocean left these fleeting abstract images in the sand, couldn’t resist! This recent silverpoint drawing is a section of intertwined vines and branches that I found in the woods and had to have. The more twisted the better. (I’m also attracted to bamboo that is bent, curved, or somehow different than the others.) These things have grown naturally like that and are great finds! 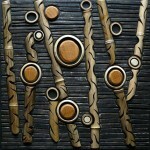 The actual piece will become a focal point in some future “work in wood” that I create. Until then, I get to know it by drawing and sometimes painting it. A silverpoint drawing is made by using a silver rod that is typically inserted in a holder. 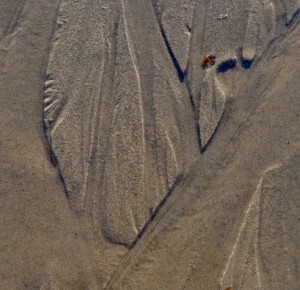 The drawing surface, or ground, is prepared, that is, it must have a “tooth” that allows metal from the silver rod to rub off. The term metalpoint refers to any metals – silver, gold, copper, aluminum, etc. – that could be used in the same way. 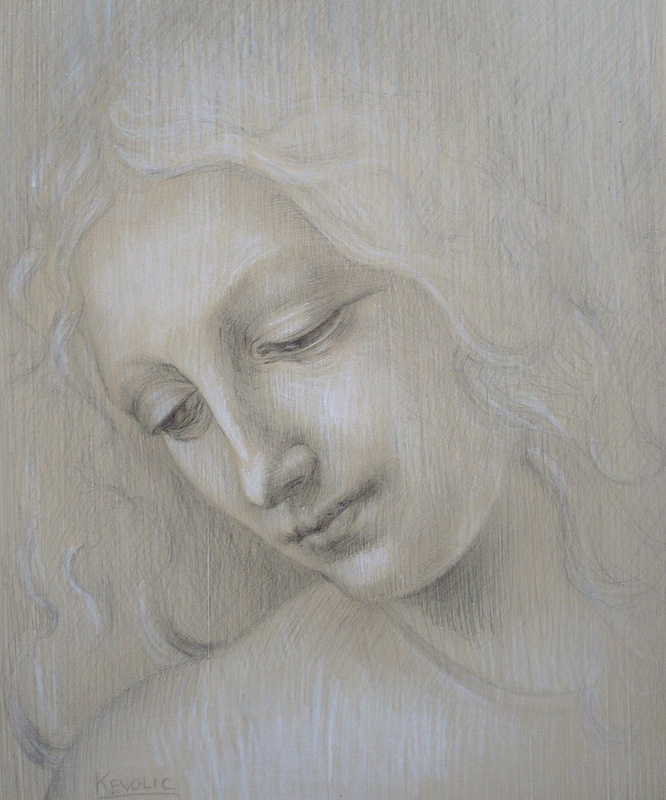 I’ve been drawing in the Renaissance-era medium of silverpoint since the mid-1980s when I worked as an assistant to a fine woodworker, who was also a fine artist. We would break up the work day by exploring this medium – preparing traditional silverpoint formulas with rabbit skin glue and whiting, heating the mixture, and applying thin layers of it to leftover wood panels. An uncoated support won’t do since the ground must give the silver something to attach to as it is dragged across the surface. We made holders for the silver rods, and wooden cases to contain these and a few prepared panels. That Old-World apprenticeship was highly satisfying! Here’s a great link: SilverpointWeb.com for history, resources, Renaissance and contemporary artists, questions, etc. 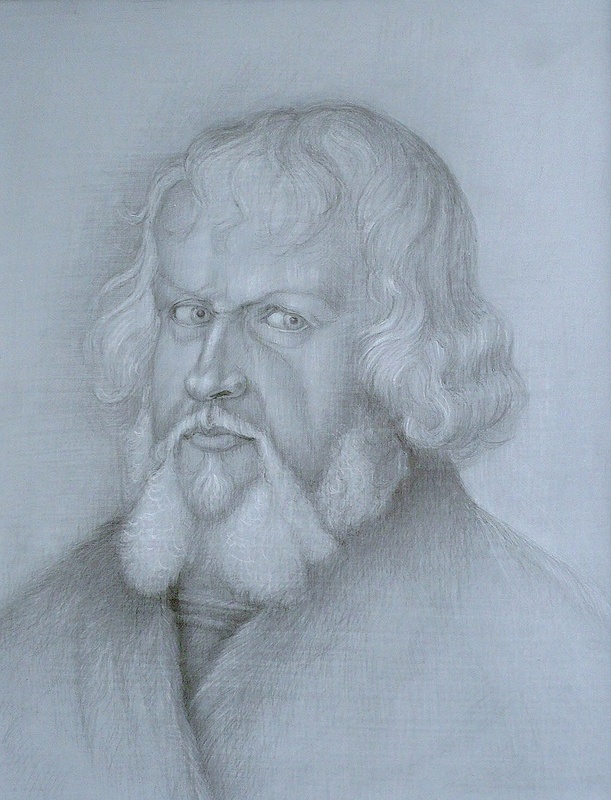 I got in the habit of copying faces from the masters of that period in art history. 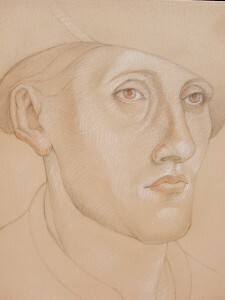 These are some of my earlier works, this one inspired by a detail from a DaVinci painting. I was constantly experimenting with tinted grounds, then adding details in white or color pastel. This was inspired by a Dutch artist, whose name I don’t remember. Mona Lisa, after DaVinci’s. 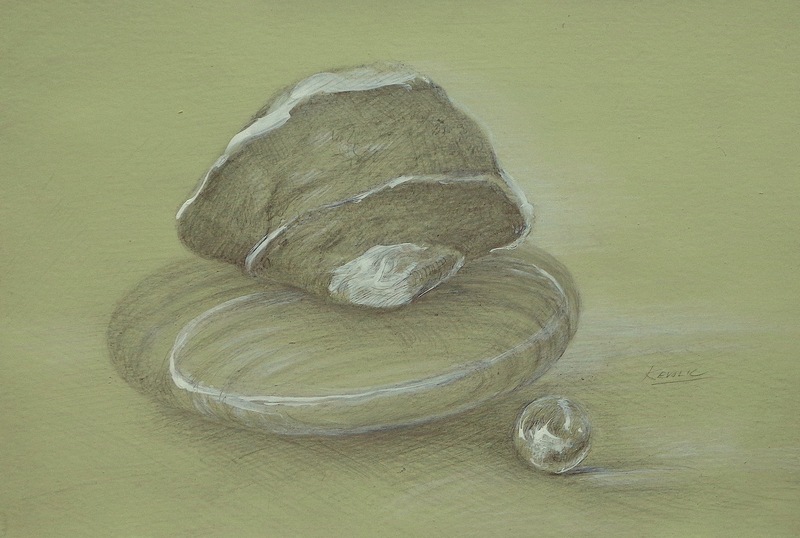 This is 7 x 5 inches. 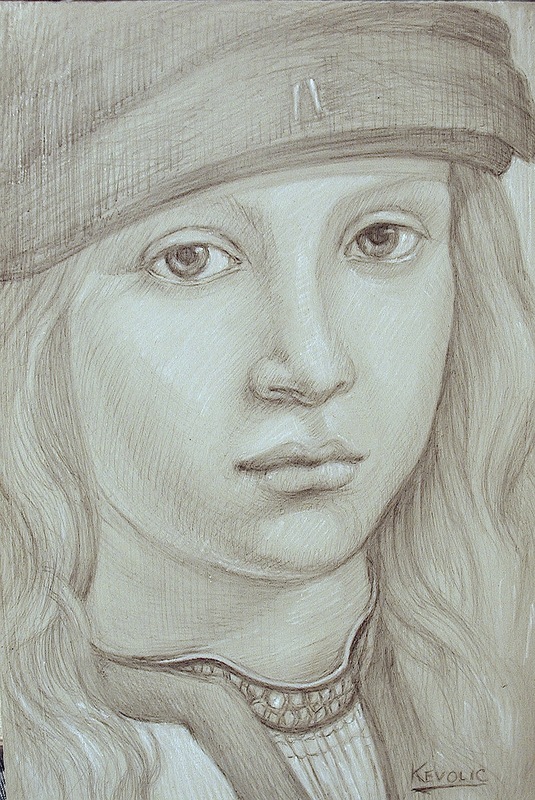 A 7 x 5″ face of a Renaissance boy, based on a Boltraffio portrait. I love the headwear on Jan Van Eyck’s models. This is based on a portrait of Arnolfini. 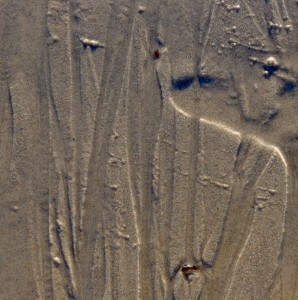 My original image is 12 x 8 inches, mounted in a frame that I made specifically for it (photo upon request). I was experimenting with a mottled background in this piece. 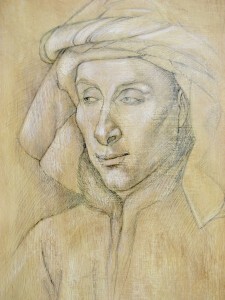 More great headwear, this time inspired by a painting of Rogier Van der Weyden’s. 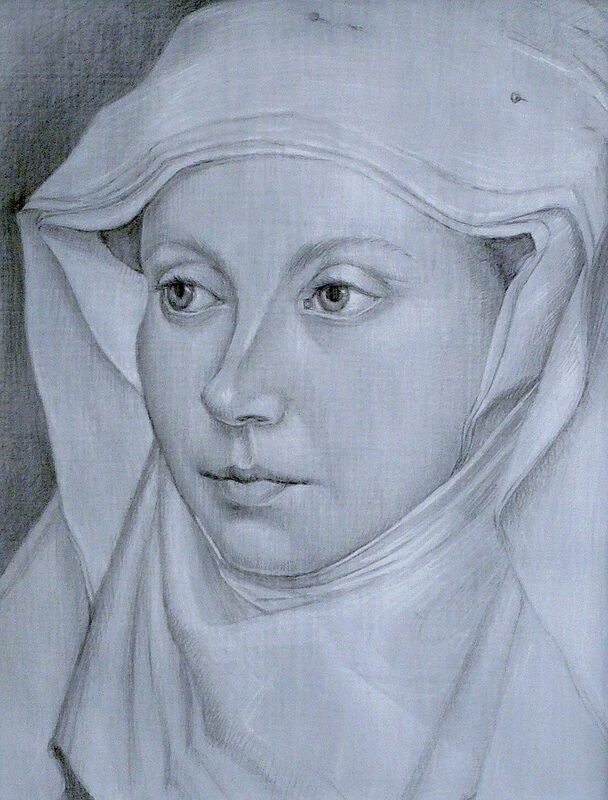 Years back, I created a large series of silverpoint drawings based on these masters’ works. This evolved into a series of accompanying decorative paintings, where I took great liberties in expressing my love for this era. 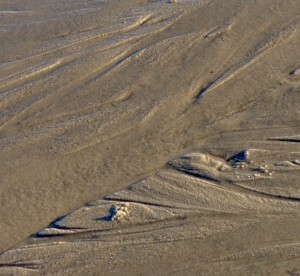 The images are familiar, but with a twist. This is a larger, pretty recent drawing that was inspired by a Durer portrait. 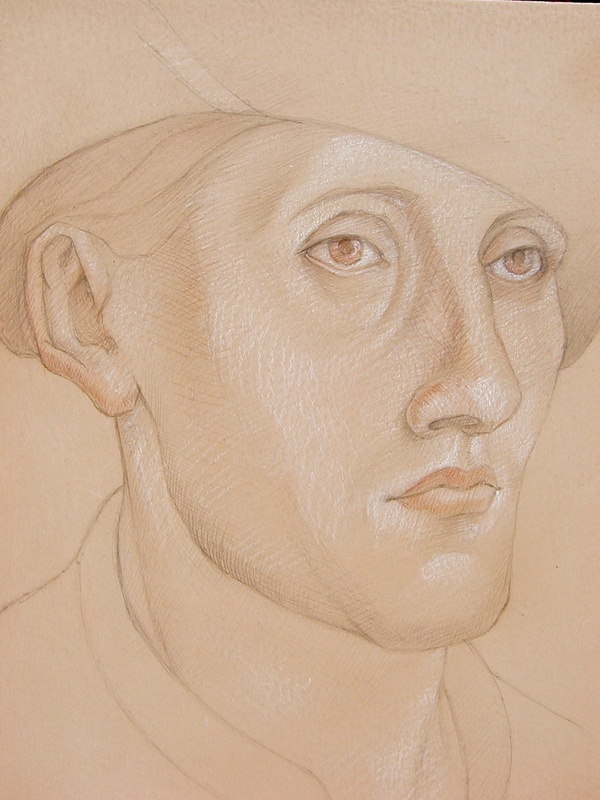 This is one of my favorite drawings, not based on the Renaissance era but from today. 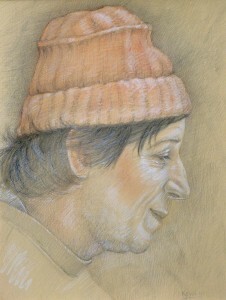 He is a fellow named Maximov, a mason’s assistant, wearing a knit hat on a wintry day. I thought I’d take you down one of the paths on my art journey so far. That’s something we all have…a unique journey, one road always leading to another. New shows! New Work! New Website! I’ve been Spring cleaning and giving myself a fresh start after months of preparing new work for back-to-back shows in the past six months. Meanwhile, out with old notes, and files, and stuff and in with who knows what? We’ll see what emerges! 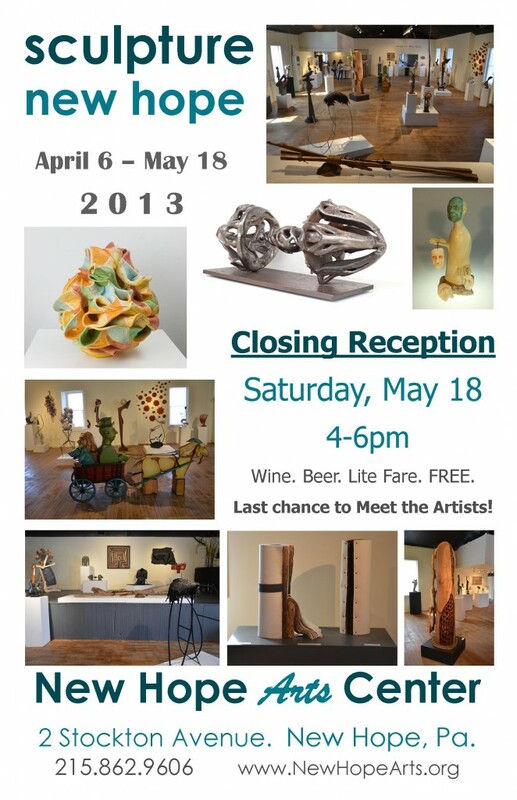 Quick Recap: April brought the opening of SCULPTURE New Hope 2013 (there’s an Opening Night photo). 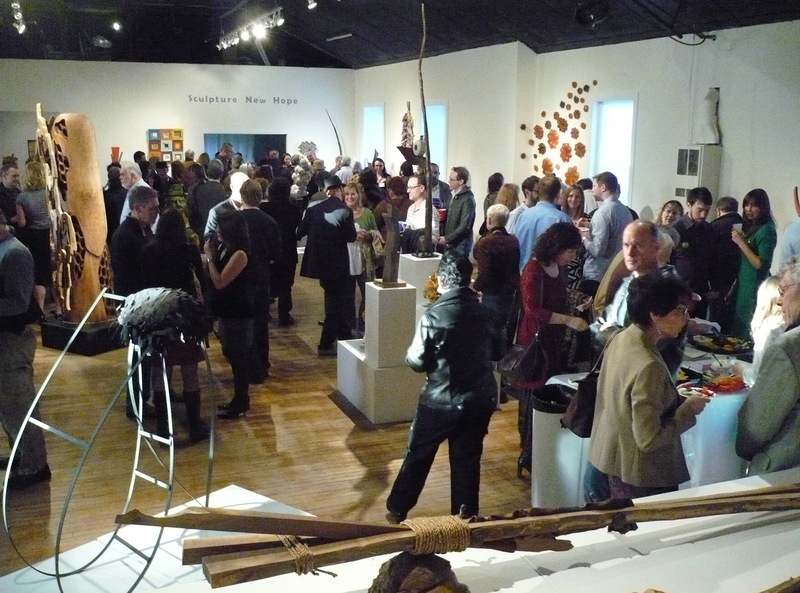 I’m thankful that my bamboo labyrinth “Journey” and bamboo mosaic “Possessions” were selected for this popular show, giving me the chance to exhibit with so many interesting artists! This is a new venue for my natural mosaics, as they are sculptural wall-mounted works. There’s still plenty of time to see it at the New Hope Arts Center before May 18th. You’ll love it! Kids will love it too! In March I had a 2-person show at the Artists’ Gallery in Lambertville, NJ called “Breathing the Same Air” where I introduced my latest landscape paintings to this gallery. Most of the landscapes were from NJ-PA locations: Washington Crossing, Stockton, Peace Valley Park, and my own back yard in Solebury, PA… They were accompanied by silverpoint drawings of intertwined vines, flowers, animal skulls, beach stones, seashells…an assortment of natural elements. The previous show that I spent many months preparing for was about another natural element – bamboo. 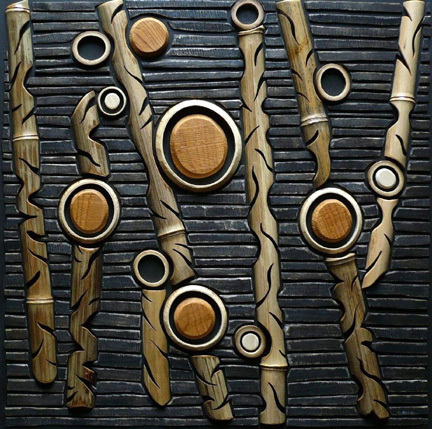 This show was called “Expressions in Wood, Glass, and Bamboo” and that was also held at the Artists’ Gallery, back in September 2012. 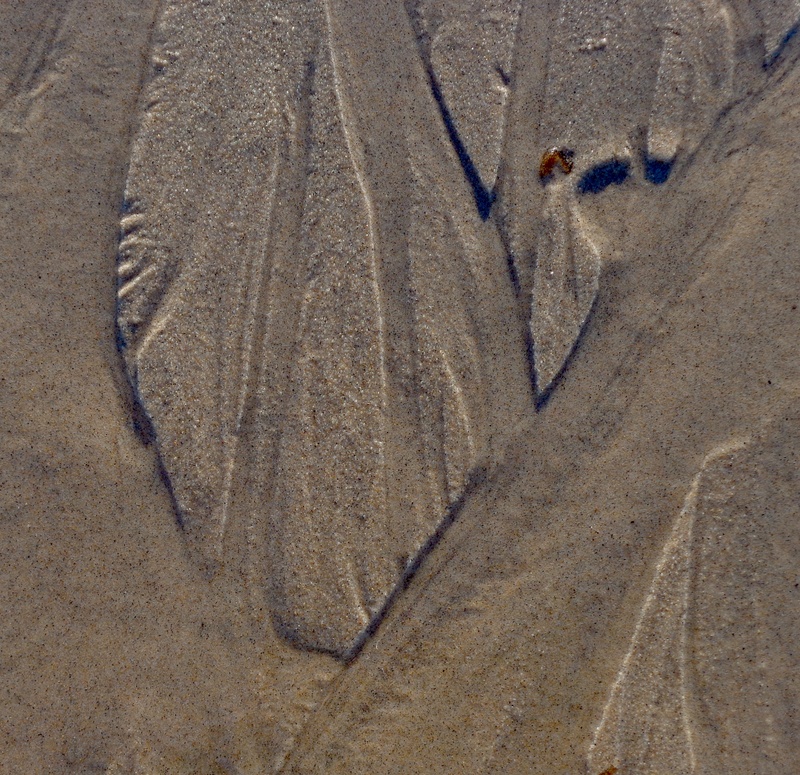 Many Thanks for subscribing to my blog! 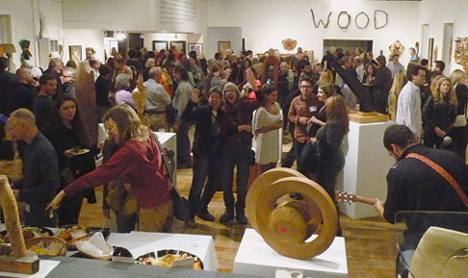 There was bumper to bumper traffic on the floor at Saturday’s opening of the 2012 Works in Wood show at New Hope Arts Center! I didn’t get to see everything on display but will return to have a good look at the works, with space enough to walk around them! 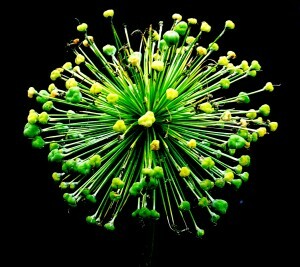 If you aren’t able to visit the show, which runs until December 9, check out the video by Bob Krist at New Hope Arts. 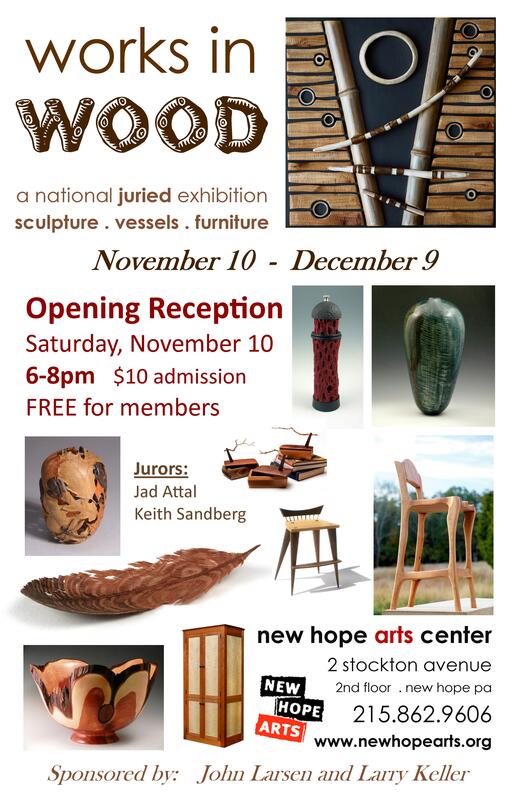 Please check New Hope Arts for all details. You’ll be fascinated by the diversity of objects – elegant and fanciful objects, modern and traditional, innovative and expressive. Discover the beautiful work of these fine artists who love their craft and have been dedicated to it for many years… We hope to meet you here. 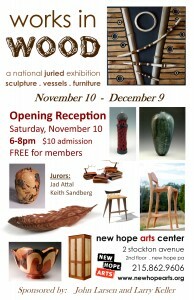 Get yourself to Works in Wood at New Hope Arts!